What do you suggest to stop hair loss and stimulate new hair growth? Hi Ann. Thank you for your question regarding hair loss remedies. Firstly, the external remedies listed in the chart above are very useful, so it's worth experimenting with these to find the best ones for yourself. The onion remedy works extremely well but the smell puts many people off. You can add some lemon juice to the mix which helps to neutralize the smell and also helps with preventing hair fall. Home Remedy for Thinning Hair #1... 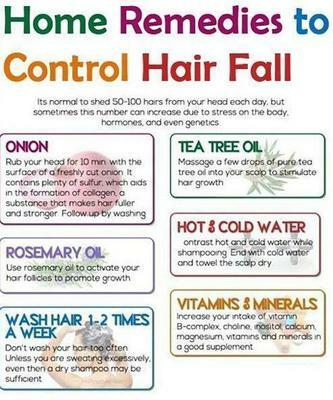 Essential Fatty Acids (EFA's): The number one reason for hair fall in women is an essential fatty acid deficiency. EFA's are crucial for healthy hair and stimulating new hair growth. If you also suffer from greasy hair, dry and brittle hair or dandruff then this is a dead give away. The best sources of EFA's are evening primrose oil, fish oil and cod liver oil. Coconut oil (taken internally) is also terrific. Around 10,000 mg's of fish oil or evening primrose, and 3-4 tablespoons of coconut oil are needed everyday for healthy hair (you can also eat cold water fatty fish such as salmon, tuna, mackerel and herring to give you your daily supply). supplement is crucial as well. There are no longer enough of these essential nutrients in our foods any more so supplementation is critical. Make sure the supplement you buy contains magnesium. Magnesium is vital for hair growth and a healthy scalp. If not, go for something like this... Natural Calm. Natural Cure for Hair Fall #3... Apple Cider Vinegar (ACV): Organic Apple cider vinegar also works a treat for hair loss and will make your hair shiny and healthy in no time! This must be used as an internal remedy as well as external for best results. For internal use, mix 3 tablespoons of ACV in a glass of warm, filtered water (and a little honey for taste) and drink this concoction 3 times daily just before you eat. For external use, dilute some ACV with water (50/50 ratio) and soak your hair and scalp with it, massaging well. Leave on for 30 minutes before rinsing thoroughly. Don't forget, only organic apple cider vinegar should be used. Home Remedy for Hair Loss #4... Good Gut Bacteria (Probiotics): The final remedy you should consider is probiotics. New research is just now beginning to discover the connection between gut health and healthy hair and scalp. Have read of our article on dandruff. It explains this perfectly (and is still very relevant for hair loss)... Home Remedies for Dandruff and Itchy Scalp. Hope this manages to help you out Ann.